Synopsis: Texas: 1931. It’s the height of the Great Depression, and Bonnie is miles from Clyde. He’s locked up, and she’s left waiting, their dreams of a life together dwindling every day. When Clyde returns from prison damaged and distant, unable to keep a job, and dogged by the cops, Bonnie knows the law will soon come for him. But there’s only one road forward for her. If the world won't give them their American Dream, they'll just have to take it. 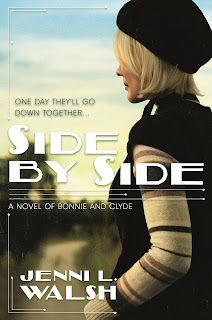 My Review: Side by Side begins where Becoming Bonnie ends. While Clyde is in jail, Bonnie impatiently waits each day for Clyde’s release. She hopes that once he is out of jail, they can buy a farm and live a happy life. However, when he is finally released on parole, Clyde becomes a different person. He is distant to Bonnie. He has a hard time finding a job because he is a criminal. Clyde soon believes that crime is the only way to make a living. He quickly drags Bonnie into a life of crime also. Eventually, Bonnie and Clyde become the nation’s most famous outlaws. Because the story is told from Bonnie’s perspective, she is mostly portrayed as a sympathetic character. She is idealistic. She wants to lead a simple life by having a farm. She also has a love of poetry and writes poems during her trials. The novel portrays Bonnie as an inactive participant in the crimes. Clyde is the instigator, and Bonnie is mostly dragged into his crimes. She just accompanies Clyde and witnesses his actions. She does not kill anyone. It is Clyde who does the killing. The novel also shows that Bonnie has an unconditional love for Clyde. She loves him for all his flaws and actions. She is willing to go wherever he goes, even if it is a life on the run. Thus, while I did not approve of her actions, I did find Bonnie to be a somewhat tragic figure. I thought all the characters were fleshed out. I especially liked her best friend Blanche. She also did not want to be dragged into crime and live her life on the run, but she also wanted to be with her husband. I found her to be very similar to Bonnie. I had a hard time liking Clyde. He always kept returning to his old habits, and he killed innocent people without a thought. I thought he was selfish and was not good enough for Bonnie. Overall, this was an insightful and empathetic portrayal of Bonnie. The story was fast-paced and action packed, and it kept me on my seat reading! In fact, I read it in one sitting! Side by Side was also well-written and provided vivid details. While I adored Becoming Bonnie, I had to say this novel surpassed its predecessor! I highly recommend this book for those that love action novels, suspense, and romance mixed in! Side by Side is hands down the best Bonnie and Clyde adaptation yet!